Hunley Submarine: See Civil War History Come to Life! The Civil War-era was one of industrious innovation and sweeping economic and cultural change. Not only would the country forever be transformed, but even the nature of warfare was fundamentally altered by the events that unfolded during this bloody conflict. In late 1860 and early 1861, the Southern states voted to secede from the United States, and formed the Confederate States of America. When South Carolina seceded, the first Confederate state to do so, they began to seize the forts within their borders and off their coastline. The only fort they were unable to seize was the most strategic and important one to the Union: Fort Sumter. Robert Anderson was the Federal Major assigned to Fort Sumter and by April 1861, he and his men did not even have enough supplies to get them through the end of the month. On April 11, General Beauregard sent a letter to Major Anderson demanding the surrender of the fort. When Anderson refused, the next day at 4:30 AM, Beauregard ordered his forces at the Charleston battery to open fire onto Fort Sumter. After two days of heavy bombardment, Fort Sumter surrendered to the Confederates. Transporting the H.L. 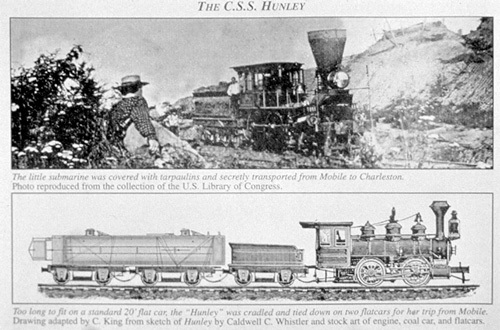 Hunley by rail to Charleston, SC. At the outset of the war, the Union recognized the importance of keeping the Confederacy isolated from foreign markets. On April 19, 1861, President Abraham Lincoln issued an order for the Union forces to begin a blockade of all major Confederate ports with the signing of the Proclamation of Blockade Against Southern Ports. Based on a plan by General-in-Chief Winfield Scott, its goal was to close all Confederate ports, preventing ships from exporting goods in support of commerce or delivering cargo and supplies to the South. Once in place, the Union’s Blockade strategy was very effective, covering 3,500 miles of coastline and 12 major ports. It was literally starving the South of supplies. The South grew increasingly desperate for any way to break the blockade to bring in much needed supplies. The newly formed Confederate States of America had to rethink traditional battle tactics at sea when up against the powerful and established Union Navy. Born out of necessity, this setting led the Confederates to make groundbreaking advancements in naval warfare and eventually led to the building of the world’s first successful submarine. The H. L. Hunley story begins here when Horace L. Hunley, James McClintock and Baxter Watson began to work together to find solutions to break the blockade. They attempted to take the battle beneath the water’s surface and built a series of experimental underwater vessels, and helped give birth to the age of the submarine. 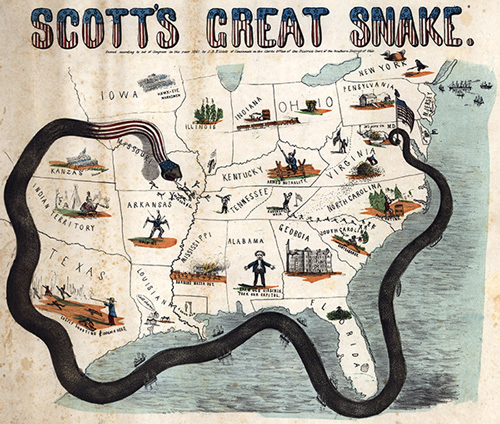 The illustration of Union General Winfield Scott’s plan to strangle the South with an economic blockade. Although initially criticized, Scott’s plan was instrumental in wearing down the Confederacy.